We go to the ring and out comes Finn Balor. Cesaro is out next with Sheamus right behind him. The bell rings and they lock up. Cesaro backs Balor into the corner and they break. Cesaro taunts Balor and gets kicked. Balor turns it around and unloads in the corner. Balor takes Cesaro down twice. Fans chant for Balor. Cesaro fights back and ends up dropping Balor with a tilt-a-whirl backbreaker. Cesaro keeps control and takes Balor to the corner. Cesaro with uppercuts in the corner now. Balor fights back and unloads to get out of the corner. Cesaro floors him with a clothesline. Cesaro with a quick pin attempt. Cesaro runs into boots in the corner. Balor dropkicks Cesaro back into the barrier on the floor. Balor with a running kick to the mouth from the apron. Balor brings it back into the ring but Cesaro distracts the referee, allowing Sheamus to pull Balor back to the floor. We go to commercial with Finn down on the floor. Back from the break and Balor drops Cesaro with the overhead kick in the ring. Cesaro runs into boots in the corner. Balor with more offense to stun Cesaro. Cesaro goes to the top but Balor kicks him in the head. Sheamus gets on the apron for adistraction. Balor turns around and eats a big uppercut from Cesaro for a 2 count. More back and forth now. Balor blocks the Sharpshooter and the Swing by getting the bottom rope. Cesaro goes for the superplex from the apron and nails it. Cesaro with a 2 count on Balor. Cesaro ends up getting the Sharpshooter applied in the middle of the ring, turning it into the Crossface. Finn rolls through the Crossface and ends up breaking the hold. Balor comes back with a Slingblade and more offense. Balor goes to the top but Sheamus gets on the apron. Balor kicks him off. Cesaro comes at Balor but gets sent to the floor. Balor runs the ropes for a dive onto Sheamus and Cesaro. Balor brings it back into the ring for a big top rope stomp to the back of the neck. Balor covers Cesaro for for the pin. – After the match, Balor stands tall as we go to replays. Balor celebrates and heads to the stage. He stops and turns around as Kane’s music hits. Kane comes out but Balor unloads on him. Kane drops Balor with a kick to the face. Kane scoops Balor for a Tombstone Piledriver on the stage. Officials check on Balor as Kane marches to the ring while his music plays. Kane waits in the ring as the music hits and out comes RAW Tag Team Champion Seth Rollins with his partner Dean Ambrose. They come through the crowd. Cole confirms that Roman Reigns is still out with the viral infection that had been going around. We go to commercial. Back from the break and Rollins attacks but Kane grabs him. Rollins fights free but Kane drops him. Kane sends Rollins to the floor and follows as Ambrose looks on. Kane whips Rollins into the steel steps but Rollins lands on his feet and goes back to the ring. Rollins drokicks Kane from the ring. Rollins goes for a big dive through the ropes but Kane meets him with a right hand. Kane comes back into the ring and clotheslines Rollins for a 2 count. Kane keeps control as fans chant for Rollins. Kane with more offense and a pin attempt. Rollins fights back and tries to kick Kane’s leg out. Rollins mounts Kane in the corner but Kane pushes him off. Rollins charges but Kane drops him with a right hand. Kane stands on Rollins and uses the middle rope on him. Kane with a big clothesline in the corner and a splash. Kane with a sideslam for a 2 count. Kane keeps Rollins grounded now. Kane ends up running into a boot in the corner. Rollins makes a comeback and hits an enziguri. Sheamus and Cesaro are at ringside watching the match now. Rollins with more offense and a Blockbuster. Kane goes to the floor for a breather. Rollins nails a suicide dive. Rollins goes back in for another dive but Kane gets back to his feet first. Kane returns to the ring. The Bar has words with Rollins and Ambrose now. Rollins goes into the ring with a springboard clothesline but Kane swats him away. Rollins with another shot to bring Kane to one knee. The Bar is double teaming Ambrose now. Rollins breaks it up with a dive. Rollins goes back in and Kane chokeslams him for the win. – After the match, Kane stands tall as his music hits. Kane grabs Rollins for another chokeslam but Ambrose makes the save and hits Dirty Deeds. Kane sits up as Ambrose checks on Rollins. The Bar hits the ring and beats Ambrose down. Kane with a Tombstone on Ambrose. Kane with a Tombstone on Rollins now. Kane stands tall over the RAW Tag Team Champions and looks down at them as his music hits. We get replays and come back to Kane laughing on the stage while The Bar stands in the ring. Officials are checking on Rollins and Ambrose. Back from the break and The Miz is ranting to The Bar about how he thinks Braun Strowman is back and how Kane said Miz is on his own. 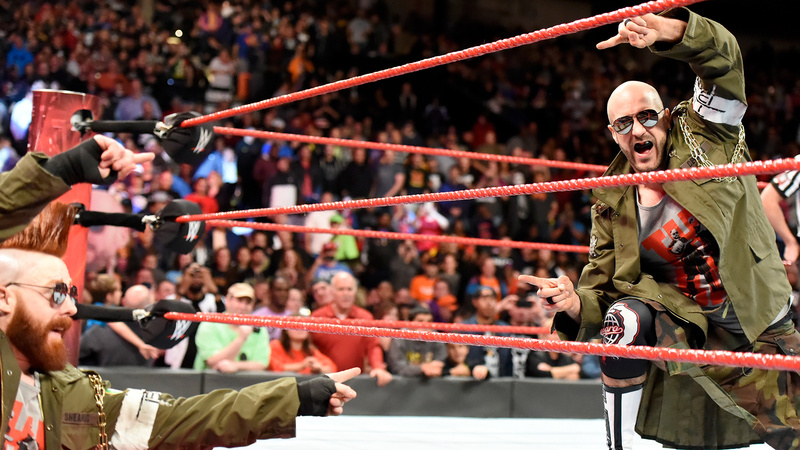 The Bar tells Miz to relax as there’s no way Braun could recover from what happened at TLC that quick.